The new "Captain America" film is hitting America's screens this Friday. If you thought he was another friendly comic book hero - think again. RT takes a look at why some movies get made in Hollywood, and others don't -- and who really stands behind this. The stars, the stripes and the shield - Americana of questionable taste at its best. 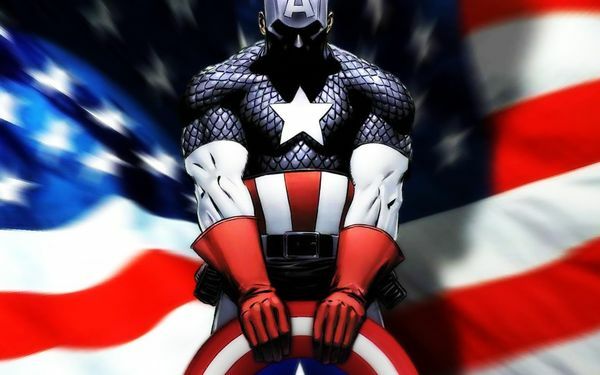 The comic book hero created at the dawn of the Second World War- Captain America is back - costume-clad and ferocious. Back then - the hero provided an extra boost at a time of pride and strength for the US. "America is kind of like an old athlete standing in front of its saggy trophy case, his paunch going over, remembering his old glory," said poet and philosopher Phil Rockstroh. Meant to lure youth into the "magic of war" back then, could propaganda still be the Cap's purpose today? "Now, it's so sophisticated that you don't always realize it, because of the audience's tastes. They don't like tricks ranging from way to obvious product placement all the way to up to propaganda," said Megan Angelo, entertainment editor at the Business Insider. This may not be the case for the more impressionable audience that would go to see "Captain America" these days. Take any action-filled war movie. "Filmmakers, if they want to make a film about the war, any war, and they want to use military technology, they have to have the support of the Pentagon. Scripts go to Pentagon, the Pentagon reviews the scripts and approves or rejects any collaborations. Directors know exactly what they're doing. They get their funding and their weaponry from the Pentagon, it's a very close relationship," said war correspondent Keith Harmon Snow. "'King Kong' - a lot of racist stereotyping about Africa that covers up the US role in the invasion of Central Africa. 'Apocalypse Now,' which used helicopters that actually were being used to put down anti-American insurgents in the Philippines at the very time it was being made. 'The Last King of Scotland,' which is a false story about Uganda. There is "'Black Hawk Down' about Somalia." Snow named a few. The list, however, goes on. "Compelling" films such as "Rambo-2" end up even shaping war history, suggested editorial columnist Ted Rall. "There is a monologue in that movie, where Sylvester Stallone starts talking about how he and other troops came back from Vietnam and were literally spat upon by anti-war protesters," he said. No factual evidence of such an act was ever found by historians, but some people's approach to these events changed. "After 'Rambo-2' came out, people started remembering that this had happened to them," said Rall. While America's enemies come and go, the regularity with which politics get reflected in Hollywood productions is impressive. "We all have relationships in our life that are complicated. They're not all good or all bad. Yet, when it comes to relationships with other countries, to policies, we see the world in very black and white terms," said Megan Carpentier, executive editor at the Raw Story. A major movie-making corporation - MGM - is reportedly changing villains from Chinese to North Koreans in blockbuster "Red Dawn." China is too big an importer of US entertainment to take the risk of offending the country. "Hollywood is guilty of pushing messages out, but it's also guilty of reflecting cultural messages without a lot of insight," said Megan Carpentier. The Military Entertainment Complex - Pentagon's tool of manipulation has been around from the 40s and remains rampant today. "When kids go to bed at night in America, they go to bed with their Captain America, their superhero clothing on. They have sweet little dreams about becoming a superhero, who goes off, of course, to Somalia to massacre innocent people," said Keith Harmon Snow. "War is such a terrible thing. Creating films like 'Captain America' sort of make it seem heroic. There is no heroism in war. You kill because you're angry, because they killed your friend. You're just trying to get home," added Rockstroh. Meanwhile, at home - all sorts of captains clad in patriotic gear -will resume trying to convince you of what's right. Dr. Matthew Alford has long studied film, and told RT that the bulk of American movies are supported by the government in one way or another. He adds, however, that "corporate mangers are just as serious of a problem as the impact of government in terms of shaping history." Alford attests that, as the American economy fails, business are finding any way to push their products -- including taking them to the silver screen. Click link to watch second RT Captain America propaganda video with Dr. Matthew Alford (at end of story). Definitely garbage and extremely sick, such movies are. Regarding MGM switching from villanizing or demonizing the Chinese, to now doing it about the North Koreans, I read something very interesting about the Korean War around a year ago. David Swanson, author of "War Is A Lie", among probably other books, and editor of warisacrime.org, says that the Korean War was not started by NK, but rather by SK, and the government of the US knew about this and only wanted to profit from SK's invasion of or certainly aggression against NK.